This single arch road bridge was built c.1860, and lies over a now disused railway line. It has a symmetrical plan about north-south axis and a segmental arch with cut limestone voussoirs to arch ring and squared and snecked limestone to spandrel panels. Squared and snecked rubble limestone parapet with coping chamfered to track side, squared and snecked rubble limestone flanking walls ending in square ashlar piers with chamfered pier caps to east and west. Set in rural location with post and wire fences to adjoining fields. The form of this bridge is typical of several railway bridges on this railway line and shows evidence of highly skilled craftsmanship in its stonemasonry. It was built by the Great Southern and Western Railway company to carry the Athenry to Claremorris line which closed in 1972. Rating: Regional, Original Use: bridge, In Use As bridge. 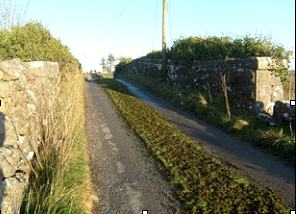 The above information is published in our history book – Killererin – A Parish History which is available for purchase elsewhere on this site.